Changes in the survival-rate during the larval phase may strongly influence the recruitment level in marine fish species. During the larval phase different 'critical periods' are discussed, e.g. the hatching period and the first-feeding period. No such information was available for the Baltic cod stock, a commercially important stock showing reproduction failure during the last years. We calculated field-based mortality rates for larval Baltic cod during these phases using basin-wide abundance estimates from two consecutive surveys. Survey information was corrected by three dimensional hydrodynamic model runs. The corrections applied for transport were of variable impact, depending on the prevailing circulation patterns. Especially at high wind forcing scenarios, abundance estimates have the potential to be biased without accounting for transport processes. In May 1988 mortality between hatch and first feeding amounted to approximately 20% per day. Mortality rates during the onset of feeding were considerably lower with only 7% per day. In August 1991 the situation was vice versa: Extremely low mortality rates of 0.08% per day were calculated between hatch and first feeding, while the period between the onset of feeding to the state of an established feeder was more critical with mortality rates of 22% per day. Mortality rates during the different proposed 'critical periods' were found to be highly variable. Survival rates of Baltic cod are not only influenced by a single 'critical period', but can be limited at different points during the larval phase, depending on several biotic and abiotic factors. The eastern Baltic cod (Gadus morhua L.) stock is historically one of the largest in the North Atlantic region  with a long-term mean abundance of 400 000 to 500 000 tons of spawning stock biomass. The stock is therefore of considerable commercial importance. Due to a combination of reproduction failure and high fishing mortalities, the stock decreased from >700 000 to ~97 000 tons from 1982 to 1992, reaching the lowest level on record in 1999 (75 000 tons; ). Spawning is generally restricted to the deep basins in the Central Baltic Sea (Fig. 1). Due to unfavourable hydrographic conditions in the Gdansk Deep and the Gotland Basin successful spawning of the eastern Baltic cod stock was restricted to the Bornholm Basin since 1986 . Unlike in other cod stocks, where salinities are sufficient to keep the eggs floating at the surface, eastern Baltic cod eggs occur exclusively within or below the halocline in 50–75 m . Therefore, especially the occurrence of anoxic conditions in the spawning layers has been shown to limit cod egg survival. A few days after hatch the larvae migrate vertically into upper water layers with sufficient prey concentrations and light conditions for feeding  avoiding critical oxygen levels. While stage specific mortality rates for cod eggs are available from both, laboratory and field studies [6, 7], corresponding information for the larval stage is missing. Especially the estimation of field based mortality rates was hampered by generally too low numbers of larvae caught and advective losses from the survey area . 'Patch' studies, i.e. to flag an aggregation of eggs or larvae with a free-drifting drogue and to monitor the developmental success of distinct cohorts [9, 10], are additionally hampered by the fact that wind stress and current shear in the Baltic influence the trajectory of the drifter significantly . The Baltic Sea and its main deep basins. Depth distribution is given by a colour scale. Due to the missing data on larval mortality in the field, it was not possible to investigate the influence of different processes on larval survival rates. Moreover, it was not possible to test the applicability of general ideas of larval survival for the Baltic Sea, as data on stage specific mortality rates are missing. Especially the concept of a 'critical period' connected to the onset of feeding [11, 12], but also the impact of hatching mortality have to be considered. In this approach we use basin-wide abundance estimates from two consecutive surveys to calculate mortality rates. Abundance estimates are corrected for transport processes using the initial horizontal distribution of larvae and applying a 3 dimensional hydrodynamic model. Mortality rates within two periods, from hatch (egg stage IV) to first feeding (larval stage 5–7) and from onset of feeding to the state of an established feeder (larval stage 8) were calculated. We compared two sampling periods, May 1988 and August 1991. The resulting mortality estimates are discussed with respect to available information on possible sources of mortality, as these are suggesting a high variability in the impact of 'critical periods' on larval survival. The horizontal distribution of cod egg stage IV and larval stage 5–7 as obtained from the first survey in each field campaign is shown in Figs. 2 and 3. In May 1988 the egg stage IV is concentrated in the area >80 m water depth (Fig. 2a). Especially 3 stations in the north, west and south of the Bornholm Basin showed higher concentrations. In the area outside the 80 m depth contour line only small numbers of cod egg stage IV were found. The distribution of larval stages 5–7 is a little wider (Fig. 2b), but the highest concentration is still found in the centre of the basin. Only to the east and south-east considerable numbers of larvae were recorded in the area < 80 m depth. During the first survey in August 1991 the centre of the egg stage IV distribution was displaced to the north-western edge of the deep basin (Fig. 3a). The station with the maximum abundance was located just inside the 80 m depth contour line, however, in this region eggs of developmental stage IV were also found shallower than 80 m depth. Figure 3b displays the distribution of the larval stages 5–7. In contrast to egg stage IV, highest numbers were now obtained in the central part of the deep basin. Considerable concentrations of larvae were also recorded in the area between 60–80 m water depth, especially in the north-eastern part of the basin. 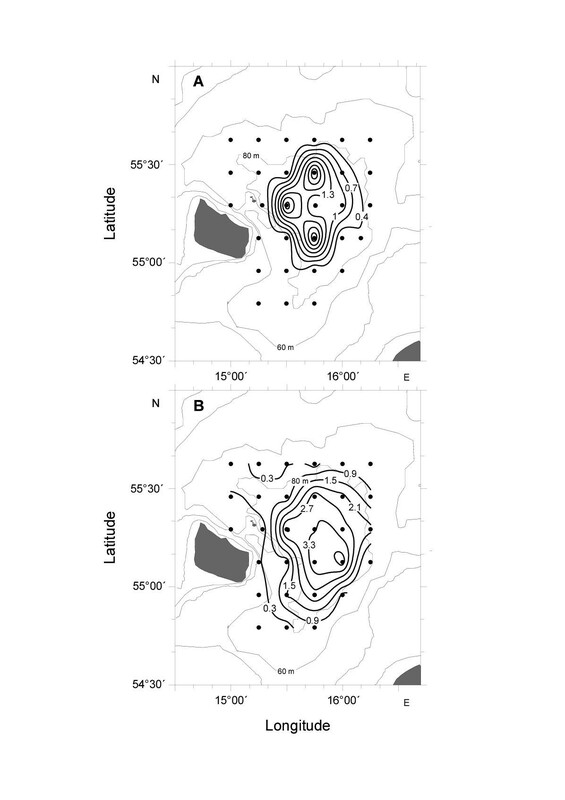 May 1988, horizontal distribution of cod early life stages: a) first survey (19 May), cod egg stage IV; b) first survey (19 May), cod larval stages 5–7; contours of abundance are drawn as n/m2 with dots indicating sampling positions. August 1991, horizontal distribution of cod early life stages: a) first survey (11 August), cod egg stage IV; b) first survey (11 August), cod larval stages 5–7; contours of abundance are drawn as n/m2 with dots indicating sampling positions. 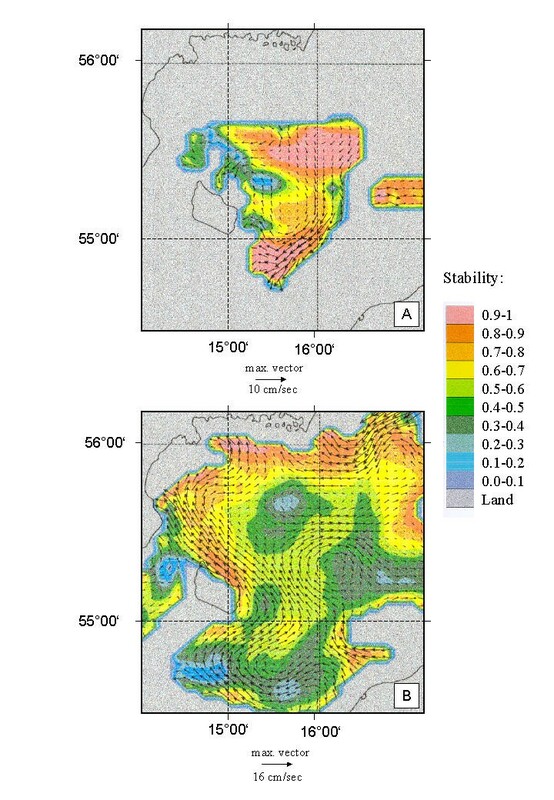 Figure 4 shows the mean circulation (speed, direction and stability) in the depth layers with maximum cod egg or larval abundance for May 1988. The circulation patterns were averaged over a 5 days period, beginning with the time point of the first survey. For the depth layer with the assumed maximum cod egg abundance (69–72 m) low transport speeds were found (Fig. 4a). Especially in the northern part of the basin and along the edges a high stability of the prevailing currents could be recognised. In the centre of the deep basin an almost circular transport regime was established. So, only limited transport rates across the 80 m depth contour line were to be expected. Figure 4b shows the mean circulation for the depth layer of maximum cod larval abundance (30–33 m). Also in this case a circular transport regime could be observed. However, the current speed is much higher and the southern edge of the circular transport extends towards shallower regions. The corresponding results for August 1991 are given in Fig. 5. Compared to May 1988 the current speeds are generally higher. Beside these differences in transport speed, the mean circulation is quite similar for the depth layer of cod eggs (Fig. 5a). The mean circulation relevant for cod larvae (Fig. 5b) looks different: In the area of the deep basin an overall transport towards the north can be observed. Water masses are transported into the basin from the south, while they leave the deep basin in a strong and stable current directed to the north-west (western part of the basin) or towards the east, north-east (eastern part of the basin). In this case larvae found in the central basin during the first survey will have the tendency to be displaced towards shallower regions in the north. Mean current fields and stability averaged over 19–23 May 1988. a) depth layer 69–72 m ; b) depth layer 30–33 m.
Mean current fields and stability averaged over 11–15 August 1991. a) depth layer 69–72 m ; b) depth layer 30–33 m.
Based on the model runs, the development of the relative distribution of cod eggs and larvae to different depth strata (> 80 m and <80 m) was calculated. These data will be used to correct the abundance values found during the second survey in the area > 80 m depth for transport gains or losses. According to the circular transport regime and the rather low current speeds in May 1988 for both, eggs and larvae, only small changes in the relative distribution were found. After 5.66 days (the time interval between the surveys) the transport patterns resulted in net losses of only 6.7 and 3.4 % out of the area > 80 m depth for cod eggs and larvae, respectively. In August 1991 stronger changes in the relative distribution occurred (Fig. 6). Although the circulation patterns in the egg-relevant depth layer were quite similar to those observed in May 1988, the difference in the initial horizontal distribution led to a strong net transport out of the area > 80 m depth during the first 50 hours of the model run (Fig. 6). After that, a weaker net transport into the area > 80 m depth occurred. After 5.92 days (interval between surveys) the proportion of eggs distributed inside the area > 80 m depth had almost regained the starting value (61% vs. 58%). For cod larvae in August 1991 a steady transport out of the deep basin can be observed, as expected according to the flow fields. Initially 54% of the larvae were distributed in the deep basin. At the time point of the second survey the proportion has declined to 42%, what means that the abundance found inside the 80 m depth contour line during the second survey will be underestimated by 12%. Proportion of cod eggs and larvae distributed inside the 80 m depth contour line. Temporal evolution due to transport processes in August 1991 (11–20 Aug.). Vertical lines indicate the temporal midpoint of sampling. For both periods (May 1988 and August 1991) average mortality rates between the oldest egg stage (stage IV) and larval stage 5 (first feeding larvae) as well as between larval stage 5–7 and larval stage 8 (established feeders) were calculated. Table 1 shows the daily production values and the corresponding mortality rates with and without correction for transport. Especially for August 1991 the correction for transport had a strong impact. In May 1988 the mortality between egg stage IV and larval stage 5 amounted to ~20% per day. Mortality rates during the onset of feeding (larval stage 5–7 to larval stage 8) were considerably lower with only 7% per day. In August 1991 the situation was vice versa. There was almost no mortality between hatch and the onset of feeding. Mortality rates of 0.08 % per day have to be regarded as extremely low for cod early life stages. The period to reach larval stage 8, i.e. to survive to the state of an established feeder, was more critical. Average mortality rates amounted to >22% per day. Obviously, during the two time periods investigated, different processes must have acted, limiting survival at different stages of development. *:at mean ambient egg incubation temperatures of 5.75°C in May 1998 and 5.87°C in August 1991. 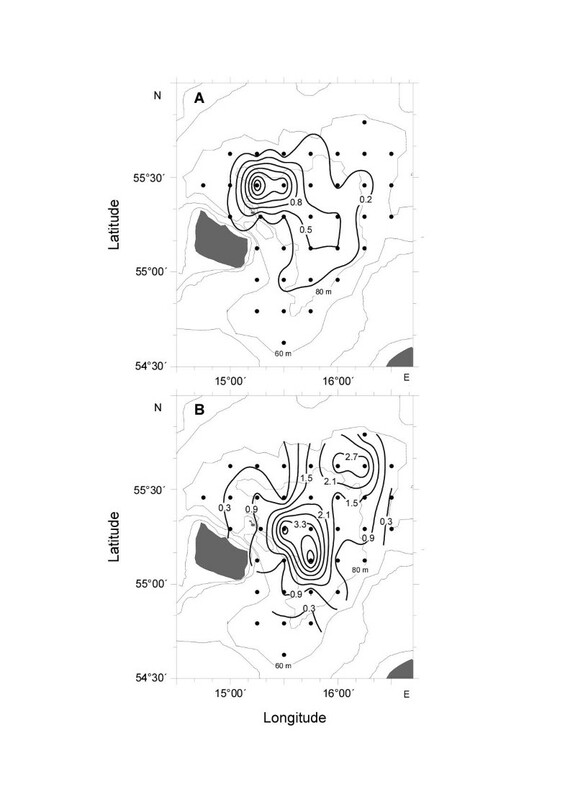 Observed (obs) and adjusted (adj) abundance (n/m2) and daily production (n/m2/d) of different developmental stages inside the 80 m depth contour line, as well as resulting mortaliy rates (M) with and without correction for transport (corr) for May 1988 and August 1991. The applied correction for transport processes had a varying impact. Especially for high speed, non-circular transport regimes these advection processes have to be taken into account, although the principle differences in mortality rates can also be seen without a corresponding correction (see Table 1). It is well known that the flow dynamics in the Baltic Sea are highly complex. They are mainly determined by the ephemeral character of wind stress, the baroclinic mass field and the complicated bottom topography . However, the Baltic Sea Model used for the simulations has generally proven to be applicable for simulating egg and larval drift processes [8, 14]. To explicitly test the applicability of the model for predicting the horizontal distribution patterns of ichthyoplankton during the investigated time periods, separate model runs were performed during an earlier study . The simulated results of this study were in good accordance with field observations, confirming the applicability of the Baltic Sea Model. This good accordance could be reached, although, as in the present study, simplistic vertical distribution patterns had to be used. The vertical position of the eggs and larvae does have an influence on their horizontal transport. Unfortunately, no direct measurements for the time periods under investigation are available. While stage-specific vertical distribution patterns of cod eggs are well investigated [6, 7, 15], corresponding information for cod larvae is rather scarce. 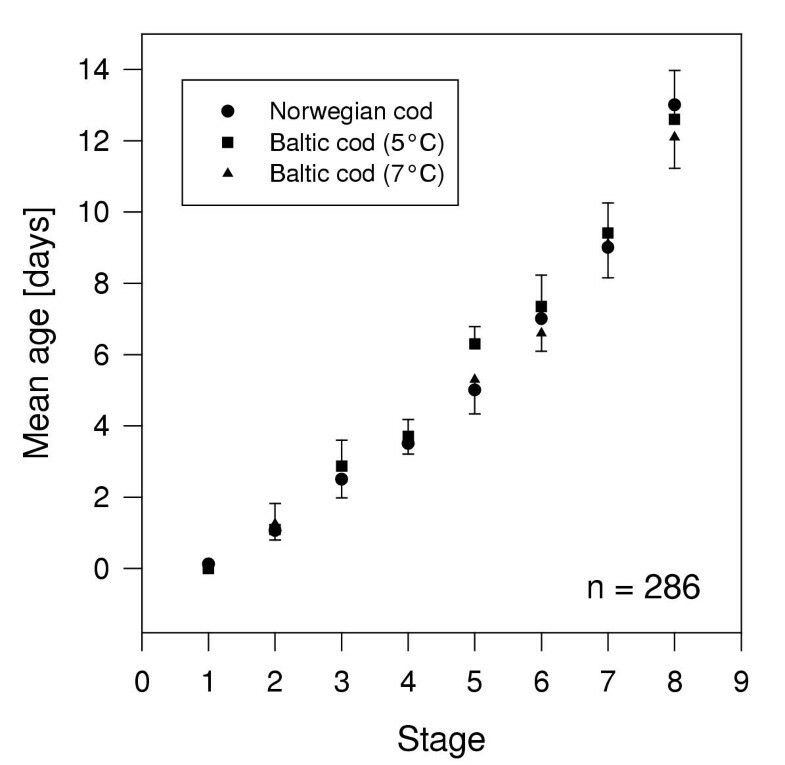 The available information on stage-specific vertical distribution of cod larvae in the Baltic [5, 16] can only be used to extract rough distribution patterns. If older cod larvae perform diurnal vertical migrations, as observed in other cod stocks  can so far not be answered. As a first approximation of the vertical distribution vertically resolving samplings 4 weeks apart from the periods under investigation were used. It is known that the vertical distribution patterns can change over the spawning period, but strong changes within 4 weeks are not to be expected. Furthermore, a sensitivity analysis conducted for the transport processes in the Bornholm Basin  revealed no significant differences in the drift patterns of cod larvae within a vertical range of 12 m. As a conclusion, we are quite confident, that the modelled development of the horizontal distribution patterns are, despite the various shortcomings, close to reality. The importance of corrections for transport processes will even increase for planned studies on sprat larval mortality, as these are distributed shallower in the water column [15, 19] and therefore are subject to higher current speeds. There is no indication for a strong small-scale patchiness of cod eggs or larvae, which would not be resolved by the station grid and thereby considerably bias the abundance estimates. As well the results from the 15 years ichthyoplankton time series as results from high-resolution samplers like the Longhurst-Hardy Plankton Recorder (Raab, pers. comm., Inst. Marine Sciences, Kiel) and the Ichthyoplankton Recorder (Mees, pers. comm., Inst. Marine Sciences, Kiel) rather led to the assumption, that the distribution and abundance of ichthyoplankton is well covered by the station grid in use. The uncertainties in the abundance estimates arising from the non-synoptic sampling procedure as well as the spatial sampling resolution can so far not be quantified, but a theoretical study dealing with this problem has been conducted by Voss and Hinrichsen (in prep.) showing mean errors in abundance estimates of 10–20%. Even after accounting for these uncertainties, the results presented here for cod larvae suggest a high variability in the importance of different 'critical periods' for recruitment. In May 1988 the period between hatch and the onset of feeding was characterised by high mortalities (~20 % day-1), whereas during the same period in August 1991 very low mortality rates were observed. Different processes have been proposed to influence survival on this stage. Viable hatch requires a minimum oxygen level of 2 ml/l . To account for year to year variations in the hydrographic environment occupied by the eggs, the so called Reproductive Volume (RV) has been defined [21, 22]. The RV defines the volume of water suitable of successful development of cod eggs by threshold levels in temperature (>1.5°C), salinity (>11 psu) and oxygen content (> 2 ml/l) as experimental studies have shown that below these limits development of cod eggs ceases before hatch [23, 24, 20]. In August 1991 the RV in the Bornholm Basin was 127 km3, substantially higher than in May 1988 with only 93 km3. Unfortunately, no field sampling for the vertical distribution of eggs was performed during the two periods, but these results as well as modelling results  suggest less favourable hydrographic conditions for the late egg and early larval stages in May 1988. Even if hatching occurs, low oxygen concentrations negatively impact larval activity . Under such circumstances hatched cod larvae might sink to deeper, less oxygenated water layers, as specific gravity increases after hatch and the larvae are not able to counterbalance the sinking rate. Another potentially important source of mortality is predation by the clupeids sprat and herring. Performed stomach content analysis of sprat and herring indicate considerable predation pressure on all egg stages in May 1988 , while for August 1991 the consumption of cod eggs by the clupeids was low . This may have the potential to explain the strong differences in mortality rates during the period from hatch to first feeding encountered in this study. The second investigated 'critical period' ranges from the onset of feeding (larval stage 5) to the state of an established feeder (larval stage 8). During this phase the larvae have to migrate vertically into upper water layers with sufficient light conditions and higher prey concentrations for successful feeding . Predation on these larvae is of less importance, as the vertical overlap between prey and predator is rather limited, with the clupeids feeding within and below the permanent halocline [26, 27]. Correspondingly, in May 1988 almost no larvae were identified in the diet of herring and sprat. In a time series principally covering the spawning seasons from 1988 to 1996, only in August 1991 relatively high numbers of cod larvae were found in the stomachs of herring , indicating an increased predation pressure. Another possible source of variation in survival are differences in prey availability for the larvae. Unfortunately, there are no data on abundance and distribution of suitable prey organisms, like copepod nauplii and small copepodite stages [28–30], for these time periods. The only indication available is that the total meso-zooplankton biomass in the Bornholm Basin was higher in August 1991 than in May 1988 . However, it has been suggested, that prey abundance in the Bornholm Basin is always sufficient to ensure feeding success of cod larvae . Therefore the potential influence of changing prey availability remains to be clarified. The ability of the larvae to migrate vertically and to establish as feeding larvae might be influenced by their energy reserves, i.e. the size and quality of their yolk sac. Egg size is a function of fish size and the batch number spawned . In the beginning and at the end of the spawning season the egg size is smallest. While it was main spawning time in May 1988, August 1991 corresponds to the late spawning season . 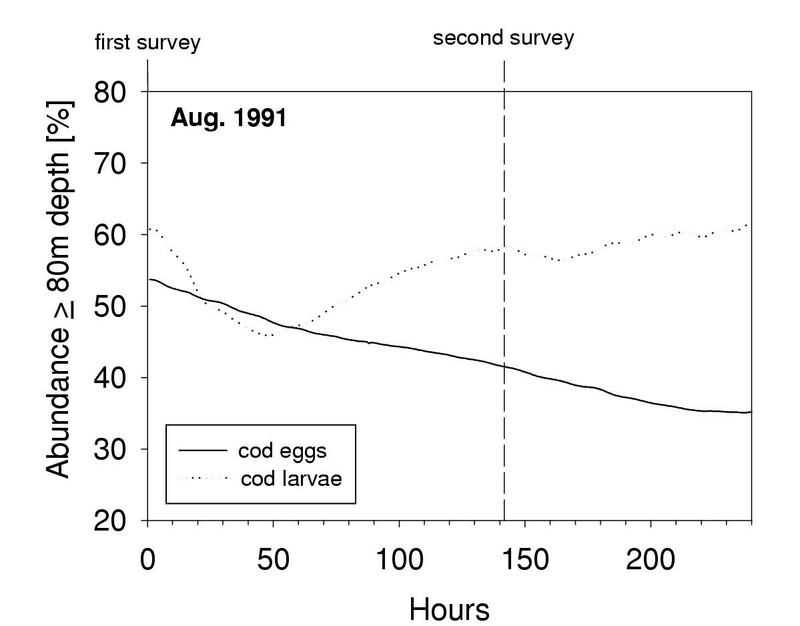 There are no direct egg diameter measurements available, but due to the relative spawning time egg diameter and therefore yolk reserves should have been higher in May 1988, favouring survival of the larvae. The different mortality rates found for the two investigated periods can not easily be attributed as inter-annual or seasonal differences. Due to the complex abiotic and biotic relationships in the Baltic Sea, it is rather a combination of both effects. However, the two time periods, May 1988 and August 1991 revealed the peak larval abundance in each year, so that changes in mortality rates probably had a comparable impact on the resulting recruitment. Baltic cod recruitment decreased strongly in the beginning of the 1980ies. Since 1985 it fluctuated around a rather low level compared to the late 1970's and early 1980's. Both investigation dates exhibited outstanding high abundance values for cod larvae in the last 15 years . While the spawning stock biomass as well as the potential egg production were higher in 1988 than in 1991 , recruitment in 1988 reached only an intermediate level (compared to the 'low recruitment phase' since 1985). The 1991 year-class was above average, but by far also not reaching the values from the beginning of the 1980ies. It becomes obvious that also after reaching the state of an established feeder processes must act as bottlenecks of survival, limiting year-class strength. Besides others, transport processes have been shown to influence survival probability [35, 8]. Transport processes have the potential to strongly influence abundance estimates, especially for cod larvae. These processes have therefore to be accounted for when calculating mortality rates. Mortality rates during the different proposed 'critical periods' were found to be highly variable. Survival rates of Baltic cod are not only influenced by a single 'critical period', but can be limited at different points during the larval phase, depending on several biotic and abiotic factors. It becomes further obvious that also after reaching the state of an established feeder processes must act as bottlenecks of survival, limiting year-class strength. Field based mortality estimates, as presented here, may help to disentangle the influence of the various stage-specific processes under consideration and to better understand the mechanisms regulating year-class strength. Stage/age relationships of Baltic cod larvae compared to given Norwegian data . Larval age in days after hatch. Mortality rates were estimated by comparing the daily production of a given developmental stage at the first sampling date with that of a corresponding stage at the second sampling date (cohort method). Temperature-dependent incubation time of eggs were calculated  with an estimated ambient mean temperature . As the consecutive surveys were approximately 6 days apart, the developmental stages had to be chosen accordingly. Mean stage-specific ages as well as exact time intervals between successive samplings are given in Tab. 1. As the time interval between the sampling dates did not match exactly the difference in age between developmental stages, the daily production observed at the second sampling date was adjusted . For the young (hatching) larvae mortality rates were calculated from egg stage IV (oldest egg stage) to larval stage L5-7 (first feeding). For the older larvae larval stages 5–7 were compared with larval stage 8 (established feeding). While the station grids covered the area > 60 m depth, all calculations were based on the mean abundance (n/m2) of the developmental stages inside the 80 m depth contour line. This was done, as abundance values outside the observation area were unknown and therefore no reliable exchange rates due to transport could be calculated. By restricting the calculations to the area > 80 m depth, reliable exchange rates between the areas 60–80 m depth and > 80 m depth could be derived from a hydrodynamic model. The abundance values were then corrected for the amount of transport gains or losses as obtained by the model runs. As the two surveys were ~6 days apart, changes in abundance due to transport processes had to be taken into account. 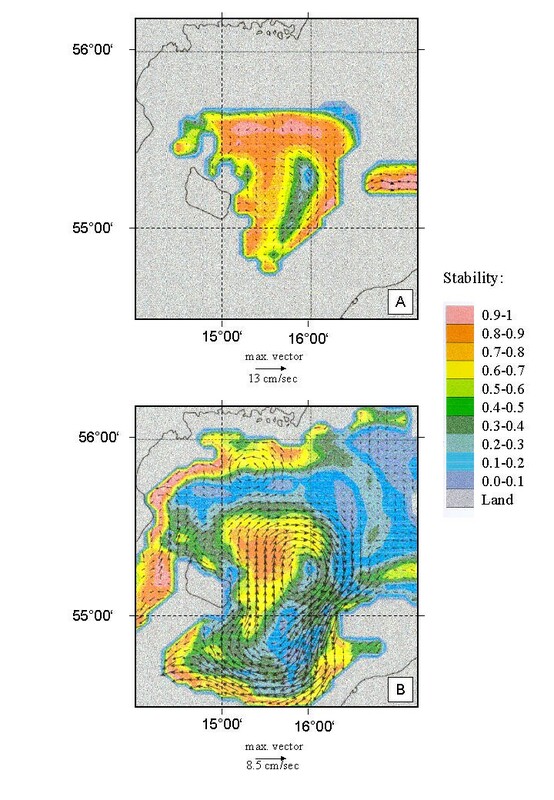 Therefore, the Bornholm Basin was divided in 3 sub-areas: >80 m, 60–80 m and <60 m. While the initial stage specific abundance is known from the survey results for the areas >60 m depth, the abundance for the area <60 m depth was set to be 0. The initial horizontal distributions as obtained by the first surveys were entered into the model as a tracer and the exchange rates between the areas were calculated over time. By this, the abundance found during the second survey in the area > 80 m depth could be corrected for transport gains or losses. The numerical simulations of the Bornholm Basin circulation were performed by application of a three-dimensional (3-D) eddy resolving baroclinic model of the Baltic Sea . The Baltic Sea Model is based on the free surface Bryan-Cox-Semtner model  which is a special version of the Cox numerical ocean general circulation model [41–43]. The Baltic Sea model comprises the whole Baltic with a horizontal resolution of 5 km and 41 vertical levels specified. For the region of the Bornholm Basin this results in a vertical resolution of 3 m layers. A grid size of 5 km and a time step of 5 min were chosen. Within the Bornholm Basin the model was initialized with three-dimensional hydrographic data (temperature and salinity) obtained during the research surveys. 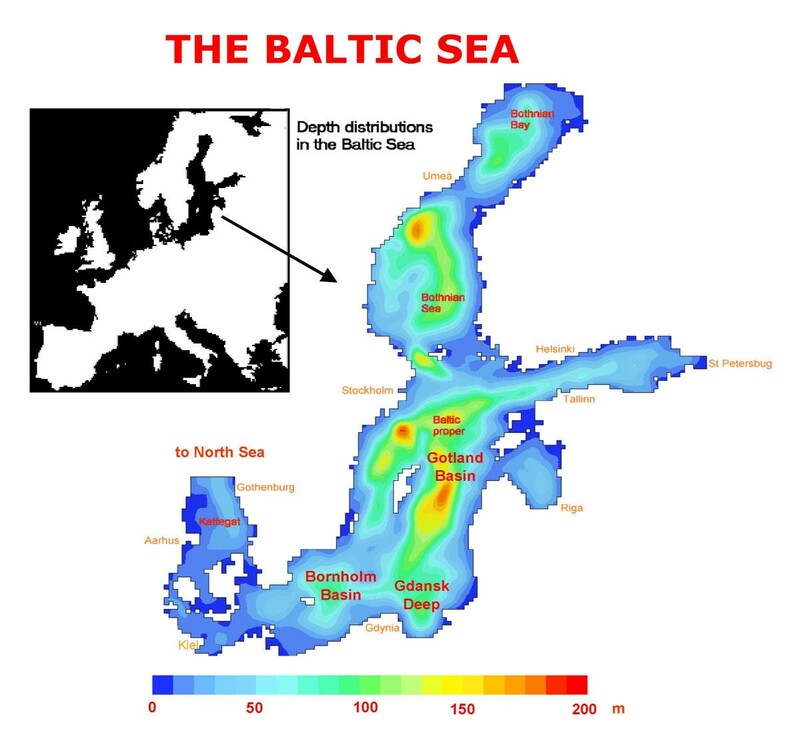 No hydrographic data were taken outside the observational area for running the model and in order to overcome this lack of data, the general features of the Baltic were utilized by incorporation of hydrographic characteristics typical for these regions and time periods obtained from previous model runs. For each depth level of the model, observational data were interpolated onto the model grid by objective analysis . The model was forced for all simulations with actual wind data for the entire Baltic provided by the SMHI (Swedish Meteorological and Hydrological Institute). In order to adapt the initial fields to the model dynamics and to the prescribed mass field outside the Bornholm Basin the model was allowed to spin-up for 4 days without external forcing prior to incorporation of tracers representing the horizontal distribution of cod eggs and larvae. After this initialization period, the forcing was switched on and the model was run for a period of 10 days. The two periods (19–28 May 88 and 11–20 Aug 91) exhibit contrasting wind forcing scenarios: In May 1988 wind forcing was relatively low in magnitude and variable in direction. In contrast, the simulation for August 1991 was affected by relatively strong wind forcing of mainly western directions. To visualize the persistent circulation patterns averaged model results for different depth layers in the Bornholm Basin will be presented. However, averaged currents give no information about their variability. Thus, we calculated the stability which is defined as the ratio of the averaged vectorial velocity and the averaged arithmetic velocity. and as the averaged components of the flow, and N as the number of current observations at the location under consideration. The vectorial mean is obtained from individually observed current vectors, and the arithmetic mean velocity is calculated by averaging the speeds without regard to the current direction . We thank Lonny Hansen of the Danish Meteorological Institute for making available the wind data from the weather station at Christiansø. The work was carried out as part of the BASYS project and of the Baltic STORE project and was funded by a research grant from the European Union (FAIR CT 98–3959).